A team of researchers from the U.S. and Canada have discovered two of the largest black holes we know of, as published in 2011 in the journal Nature. The event horizon of these holes, region within which no light can escape, extends to a distance similar to 200 times the orbit of the Earth or 5 times the orbit of Pluto. “It could also be compared with the size of our solar system”, says Chung-Pei Ma, a researcher at the University of California at Berkeley (USA) and an author of the work. “Since we can not see black holes and that not even light can escape its pull, the study by measuring the velocities of stars orbiting ‘very close’ to them”, says Chung-Pei Ma. The mass of one of the two central black holes discovered by researcher Chung-Pei Ma and her team in the galaxy NGC 3842 is 9,700 million times larger than the Sun. The other located in the center of the galaxy NGC 4889 could be even greater. To obtain the data, the team of astronomers made use of the Gemini and Keck telescopes in Hawaii and the facilities of McDonald Observatory in Texas (USA). The discovery suggests that the processes of growth of large galaxies and their black holes are different from those of smaller galaxies. Due to variations in brightness and luminosity of quasars found in the early universe, experts believe that every massive galaxy spheroid shaped houses a supermassive black hole at its center that power. 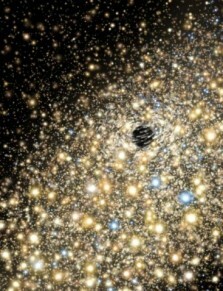 Astrophysicists also believe that this type of central black holes have masses could reach 10,000 million times the sun but a hole of this size has never been confirmed.